Translation: "I was not treated like VVVIIP and I'm going to throw a hissy fit over it. I'm a Cricket celebrity, get me out of this visa line." I think he is over reacting because government departments in South Africa are similar if not worst than Pakistani government departments where you have to wait for a long time before your turn comes. 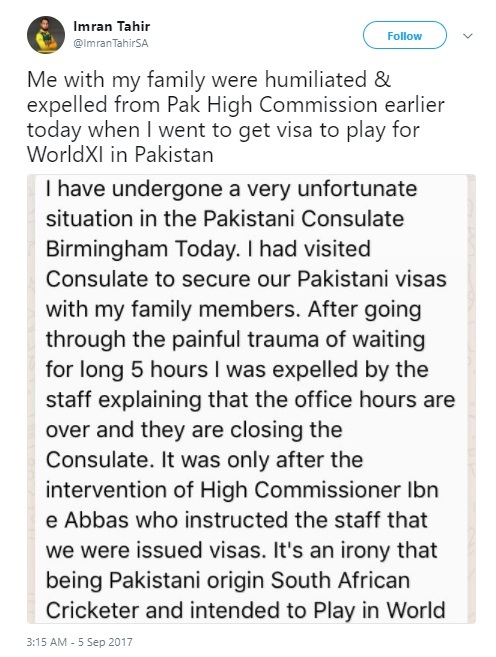 Ok I understand he waited 5 hours, but this is normal because I remember one of our relatives telling that they spent whole day there waiting to get someone to speak with and ended up coming back another day. It's not unheard of. No VIP status for you.